Building on a legacy that dates back to 1938 and the grand opening of The Iridium Room at The St. Regis New York, Iridium Spa in Astana articulates the same distinctive elegance-both in the enthralling design of its treatment rooms suites and in thoughtful gestures like a signature tea ritual. Committed to providing an unparalleled wellness experience, the 2300-square-meter Iridium Spa, located at the third floor of The St. Regis Astana and overlooking Ishim River and Central Park, unites a timeless design with celebrated therapies that blend traditional remedies with modern technologies. From the moment guests step through the door, they are treated to the rarest of all luxuries: time. Whether their custom treatment is a half an hour or half a day, it is personally crafted to meet their elemental needs. Each of our six treatment rooms - including single suite with private Jacuzzi and a couple suite with private sauna - offers a sophisticated sanctuary as our professional therapists work to revitalize the body, mind, and soul. 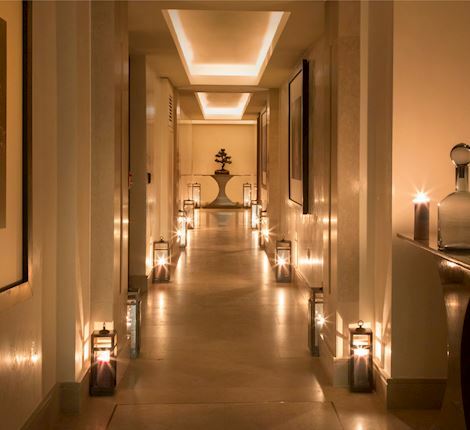 A hair, nail, beauty, and grooming salon, and a hammam add to the rejuvenating offerings. Our treatment menu comprises facials, body treatments, massages, and ample beauty services where each treatment is carefully tailored to meet personal needs and desires.